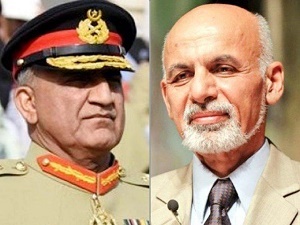 Afghan President Ashraf Ghani on Monday made a phone call to army chief General Qamar Javed Bajwa and expressed his condolences on loss of innocent lives in recent terrorist attacks. “[President Ghani] also assured COAS for enhanced border security measures on Afghan side as assistance to Pakistani security forces during [the] election period,” Director-General of the Inter-Services Public Relations (ISPR) Maj Gen Asif Ghafoor said in a post on the micro-blogging site Twitter. “COAS thanked Afghan president for his concern,” Maj Gen Ghafoor added. Nearly 150 lives people lost their lives and over 250 others were injured in three separate terror attacks in Peshawar, Bannu and Mustang. Among those killed were Awami National Party (ANP) leader Haroon Bilour and Balochistan Awami Party (BAP) candidate Siraj Raisani, while former Khyber-Pakhtunkhwa chief minister Akram Khan Durrani was targeted. The fresh wave of terrorism has revived memories of the 2013 general elections when militants targeted candidates. In turn, it has forced parties and candidates to lower the profile of their campaigning, it not stopping them completely, ahead of this month’s elections.